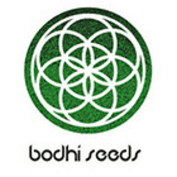 Over the years Bodhi Seeds worked on various OG kush projects and last year they have tested a very special OG hybrid called Goji OG, named after the bright red sour Himalayan berry. This hybrid has excelled indoors and out and is truly the total package with incredible full on OG aroma and taste with an undercurrent of red berries, black cherry, Hawaiian punch, licorice, sharpie markers, and Alpine strawberries. It is one of the bigger yielding OG's that still maintains the effect, aroma, taste, and resin content of a true OG. Improved stature, no more floppy stems, or insane staking required. There are two main phenos in the Goji OG line a big yielding OG smelling totem pole maker of infinite delight, and a snowed out brain melting strawberry pheno.